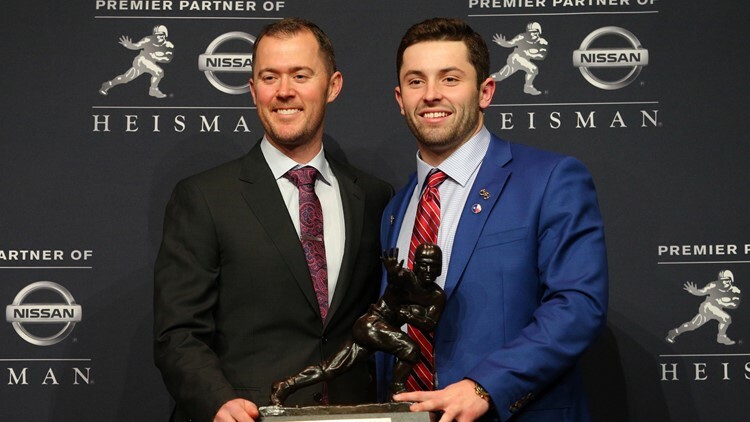 Heisman Trophy winner Baker Mayfield poses with Oklahoma Sooners coach Lincoln Riley and the Heisman Trophy during the 2017 Heisman Trophy winner press conference at The New York Marriott Marquis in New York City. Oklahoma Sooners coach Lincoln Riley seemingly shouted out Baker Mayfield after his former charge led the Cleveland Browns to a 17-16 win over the Denver Broncos. CLEVELAND — CLEVELAND -- Consider Oklahoma Sooners coach Lincoln Riley impressed. Shortly after watching his former quarterback, Baker Mayfield, lead the Cleveland Browns to a 17-16 victory over the Denver Broncos in Denver Broncos Stadium at Mile High in Denver Saturday night, Riley tweeted a succinct response. “#BoomerSooner,” Riley tweeted moments after the game. Mayfield played one year under Riley while at the University of Oklahoma, and the 2017 season ended with a Heisman Trophy Award, as well as a trip to the College Football Playoff, where the Sooners have returned and will play against the Alabama Crimson Tide on December 29. Mayfield completed 18 of his 31 attempts for 188 yards and two touchdowns against one interception in the win over the Broncos, overcoming plenty of first-half struggles after a successful opening drive that ended with a scoring pass to wide receiver Breshad Perriman. Mayfield posted on Instagram how he was “feeling dangerous” again on a gameday morning, and he certainly proved it on the first possession of the game against the Broncos. Mayfield completed two of his three passes for 50 yards on the opening drive, and 31 of those yards came on a deep throw down the right side of the field to Perriman. After securing the catch inside the Denver five-yard line, Perriman fought his way into the end zone for the touchdown. Greg Joseph tacked on the extra point, which gave the Browns a 7-0 lead over the Broncos with 11:49 to play in the first quarter. As Perriman fell to the turf, he secured the catch and maintained possession all the way through the play, which included a hard landing and a five-yard roll out of bounds for the touchdown. The Browns had plenty of success in converting red-zone opportunities into touchdowns in recent weeks, and that was a trend that continued against the Broncos in the fourth quarter. Mayfield connected on a two-yard touchdown pass to fellow rookie wide receiver Antonio Callaway, and with the extra point, the Browns took a 17-13 lead over the Broncos with 11:44 to play in the fourth quarter. Mayfield’s pass to Callaway gave the Browns 12 touchdowns in their last 12 trips inside the red zone. On first-and-goal from the Denver two-yard line, Mayfield took the snap in the shotgun formation and looked to the left side of the field for an open receiver, where he found Callaway with inside position against a defensive back in a banged-up Broncos secondary. With Callaway breaking open on the slant route, Mayfield threaded the needle and found him for the touchdown. Earlier in the drive, the Browns faced a second-and-nine from the Denver 34-yard line, and after being flushed out of the pocket, Mayfield fired a throw down the left sideline for wide receiver Rashard “Hollywood” Higgins that moved the ball down to the 16. Despite being close to the sideline, Higgins secured the catch and got both feet down in bounds for the first down.